In 1994 Miranda wrote her first book Red Moon – Understanding and using the gifts of the menstrual cycle which has since been translated into six languages. Red Moon helps women to understand who they are, explains why they feel and act like they do and guides them in how to be true to their cyclic female nature in a very masculine, linear world. From a young age, Miranda sought understanding through the ancient female archetypes that can be found in mythology and folklore. She discovered that women in the past not only had the same feelings as modern women but that these ancient women offered us understanding and guidance to our naturally cyclic energies, creativity, and spirituality. Miranda became a healer, focusing on women, and she taught workshops on the ideas and concepts cvered in Red Moon. In December 2011 her healing and channelling work came together with her Red Moon work in the Worldwide Womb Blessing. The Womb Blessing is a worldwide distant energy working that takes place five times a year. It offers healing for women on all levels of their being, restoring repressed archetypal energies and validating their authentic femininity. It is an awakening of female consciousness and a healing of our natural female spirituality. The Blessing answered the heartfelt cry from women around the world – across countries, cultures and languages – of a need for a restoration in the world of the feminine. The Womb Blessing family now consists of over 58,000 women worldwide, and it grows with each event. Miranda now teaches women to give Womb Blessings and Womb Healings in over 15 countries around the world. 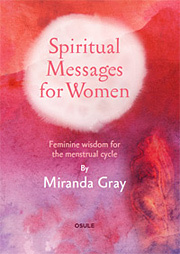 After writing The Optimized Woman, a very practical book about the menstrual cycle, Miranda returned to writing about female spirituality in Spiritual Messages for Women. This is a book of messages from the archetypes of each menstrual phase, offering help and support on how to connect with them, to embrace their gifts and to express them in our lives. The book answers the question ‘Why does a spiritual practice that brings connection to the Divine one week fail the following week?’ and shows us how to live a flexible and creative spiritual path with awareness of the Divine Feminine in all phases of our cycles.